I always wonder why Thai Food is so different in Singapore as compared to Thailand itself. Where is the authenticity??? Until I found this little gem located at Tampines Street 81 thanks to a friend of mine who brought me day. On a typical Monday evening, expect to find a young crowd tucking in to surprisingly big portions of traditional Thai style dishes. I had a fair selection from each category from the menu but having only two person to share, it was not possible to get everything I wanted. 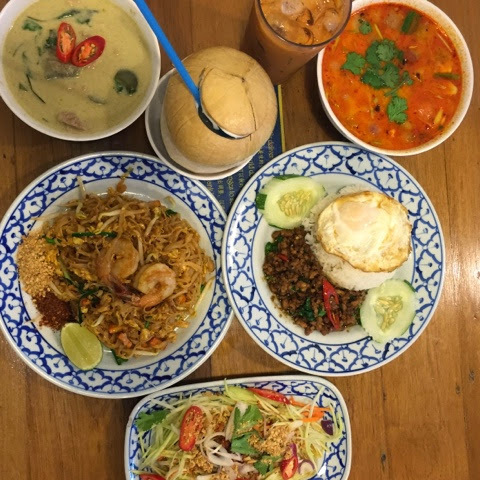 Hence, we ordered a Phad Thai, Basil Pork with Steamed Rice, Mango Salad, Thick Tom Yum Goong with Prawns, Green Curry Chicken and coconut and Thai iced tea for the drinks. We thought it was too much but we did attempt to wipe them all. I guess a Thai salad cannot run away much from being spicy, sour and salty. This was infused with aromatic fish sauce and tossed with plenty of crisp dried shrimp bits, onions and chilli slices. I felt that everything goes side by side with each other without any flavours being overpowering so that was good. As for the green curry, it was classic. Green brinjals and tender chicken chunks made up this flavour bodied curry. I have always had a weakness for curry having grown up in a family who loves it too. Never complain when it is too spicy or thick. The one at Soi Thai is just nice in terms of the spiciness with a tinge of sweetness. The Tom Yum Soup never disappoints when they are generous with the lemongrass, galangal, chilli padi and kaffir lime leaves and lime juice. The version here was just the way I like it to be. Despite being the thick one instead of the clear, it was soothing and whets the appetite for more stronger flavored dishes to come! The basil pork was surprisingly good. Since it has never exactly been my favourite because I felt it was very much similar to what my grandma could cook. (don't ask if you can try her culinary skills, the answer is NO) nevertheless, I have to say Soi Thai did a good job. I could taste the soy sauce and oyster sauce together with holy basils and garlic which soaked right through the minced pork - a delicacy. Finally, the Pad Thai was average. Lots of beansprouts and egg was fried together with the flat noodles. Forgot to mention prawns used at Soi Thai, they are very fresh, fat and crunchy. I would have thought they have a prawning farm just behind the restaurant. All in all, it cost us $41 as the prices are nett. If you stay in the east and have a love for spicy or Thai cuisine, this is a must to try.